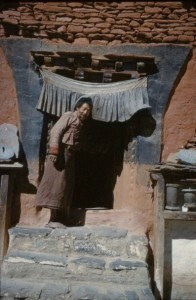 During the tenure of the second incarnation, Chhairo Gompa flourished and the extent of the physical infrastructure can still be seen outside the grounds of the current gompa. The footprint of the accommodation is visible for the lamas, monks and nuns who studied at the monastery contributing to the growth of Nyngma buddhism and the establishment of other monasteries in the region. Responding to the first Tibetan rebellions against Chinese occupation, the Chinese government closed the Nepal–Tibet border at the Mustang passes. Changes in demand for goods and opening of alternative routes and modes of transport further affected the historic trade routes and Chhairo Gompa became less and less influential. Over time, community use of the gompa also declined as the local population moved away in search of alternative work and livelihood. As with many religious structures in the region, no monks remained at Chhairo, and it was given into the hands of local caretakers who were only able to maintain the core shrine rooms and courtyard.